This time I’m going to show a variety of black oil paints to you guys. I’ll divide this in two sections, first showing my collection of black paints and then I’ll show some mixes with yellow in the second part further down. A few notes first- I tried my best to get accurate colors in all of these photos, but my lighting and camera skills aren’t the best. I made some minor adjustments in photoshop to get the light and colors to match what I see on my palette, but that’s for my own screen. I can’t guarantee what things will look like on your screen. Unfortunately I don’t have every black pigment out there (yet), but I felt I have enough to give a good idea of what’s available. The white I used for everything here was Charvin Titanium White (PW6), but I wasn’t necessarily exact in the mixing proportions. Along with Lamp Black (PBk6/7) and Mars Black (PBk11) this is one of the three most common black paints. Made from charred animal bones, depending on the brand it will either produce slightly warm greys or cool, bluish greys. I think it’s because this tube is so old that there’s been a little oil separation which you can see running down the side. I guess in an attempt to mimic the bluishness of some ivory blacks, Rembrandt has decided to add a little ultramarine blue to theirs. They’re not the only brand to do this, but I wish they’d put something in the paint’s name to let you know that the “ivory black” you’re buying isn’t just ivory black. Slightly lighter and much more transparent than the rest, this is made with ground charcoal. It has lower tinting strength. I’ve found it to be a very attractive pigment in the short time that I’ve been using it and I highly recommend giving it a try. An iron oxide. This black is very opaque and a very strong tinter. I don’t actually have this in a tube from any brand but I do have some dry pigment that I mixed with walnut oil. I really need more experience and tools for making paint because I think I made it a little too concentrated, so I wouldn’t expect mars black from a tube to be quite this strong of a tinter. I’ve read that this one dries faster than ones like ivory black. An unusual greenish black. I only recently got it and haven’t used it a lot, but it makes very muted green greys in tints and is a very dark shadow green in masstone. There’s a lot of ways that artists have come up with for mixing their own black. This is one of the more common ones because both paints used are among the cheapest and most commonly available and used. I found that I had to add more of the blue than the brown to get it about right, at least with the Old Holland versions. The end result wasn’t as dark of a black as I expected though. I would recommend staying away from the old favorite of some artists to mix phthalo green with alizarin crimson, as the crimson’s infamous ability to fade greatly after short times will mean that your mixed black will become greener over time. So here I’ve compared Gamblin’s “neutral” black spinel with Rembrandt’s ivory black, which is mixed with blue, and they both seem to have about the same amount of coolness to me. 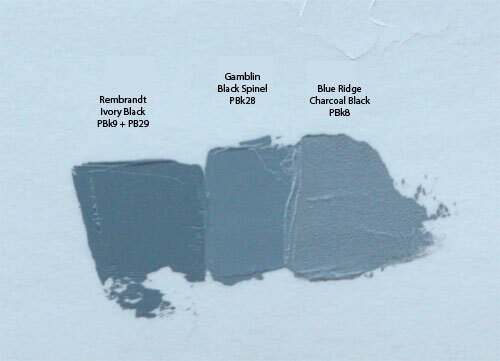 On the right is Blue Ridge’s charcoal black which I find to actually be very neutral, more so than the black spinel. So a very long time ago the Impressionists heard that black was, by definition, “the absence of color.” They therefore exiled it from their palettes so they could instead focus on light and color. While not all artists ever subscribed to this thinking, this has been handed down to us over generations of artists so that today many are taught to have a near phobia of using black paint. I’m going to show you guys just one of the many things that can be accomplished with black by mixing M Graham’s ivory black with some of the various yellows from my collection. In almost all cases I only added a tiny amount of black to the yellow. I’ll note again that on my palette every one of these mixtures is green, even if only a little, but I don’t know for sure if my camera was able to get accurate colors. The indian yellow is more of an orange than a yellow, but even so the result was a slightly greenish mix. I liked the mix with nickel titanate yellow. I don’t actually have a cobalt green pale (PG19) in oil paint and I only have a small sample in watercolor, but to me this looks similar to the pictures of it I’ve seen. The nickel azo yellow was really special. A very dark masstone with an almost golden olive green undertone. It looks a little more intense in real life. 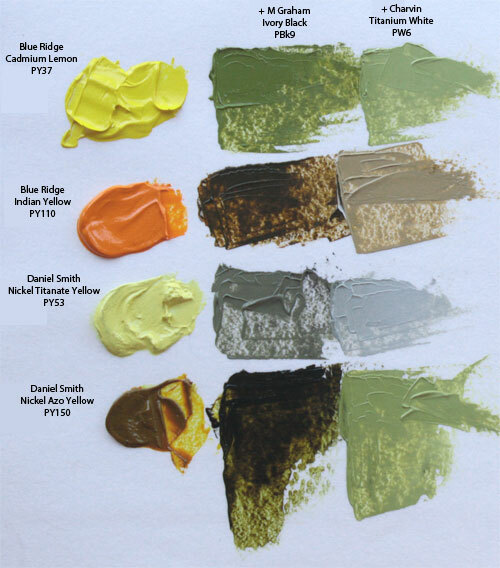 The cobalt yellow, also known as aureolin in other brands, is known to not have very good lightfastness so I normally never use it, but the olive green I got from it was interesting. The last two were a little difficult, with the mars yellow overpowering the black until I added more, and neither mix being especially green. So I have a couple of old tubes of Winsor & Newton olive green. 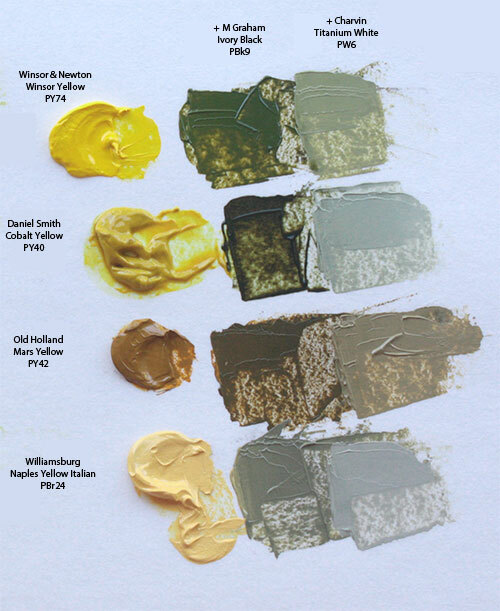 It used to be that they made theirs with a mix of PO49 and black, but in 2001 pigment manufacturers stopped making PO49, so since then everyone who used it to make paint had to switch to different formulas. That is, everyone but Daniel Smith, who apparently bought up all the remaining supply and even still has some left. They refer to it as quinacridone gold (GS). It doesn’t seem like you can get it from them as a single pigment oil paint anymore, unless you want to buy the entire quinacridone set (and I’m not sure that the one named gold in there is the real PO49 or their newer imitation mix), but they do still offer it in watercolor form. To recreate the olive green, I’ve mixed my tube with black, but probably less of it, and got a warmer green with and more golden undertones. The burnt orange was rather unexpected, because as you can see it’s definitely a reddish orange in its transparency, but yet the mix with black produced a subtly green paint. This is one of the ones that I’m not sure if it’s really showing the colors right in the photo, but in real life it actually is a bit green to me. So why mix yellow with black to get green when you can do the same with blue? There’s probably a few reasons, but one is this scale above. Starting with the yellow the paint is bright, warm, and very yellow. As I add increasingly more black the paint gradually becomes darker, more neutral, and greener, but never becomes blue. Mixing yellow with blue, at the darkest values, would be much less neutral and much cooler/bluer, but here I have a progression of bright yellow to very dark green that never enters the blue section of colors. 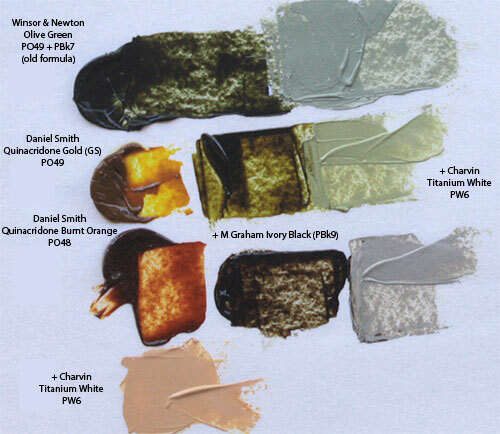 So hopefully after all that you guys might be willing not only to give black a try but maybe even consider some of the less mainstream pigments. As for myself, I’d like to try some slate black (PBk19) and maybe some graphite (PBk10) sometime soon. I’d love to see you review Utrecht oils. It was the paint they had us buy in college, in part because it was reasonably priced, but also because it was very workable. Nice and stiff. I’ve been buying Windsor Newton lately because I can just run down to my local Jerry’s Artarama and pick it up when I run out of something, but I kind of miss my Utrecht paints. May have to order some. Anyway, just thought I’d toss that out there as another brand to review. I’m really enjoying reading these, so please keep at it!